We are backed by a team of expert professionals, which supports us in trading, supplying and exporting Anti Depressant Drugs. All the medicines offered by us are available in various size of packs at market leading prices to fulfill the demands and needs of customers. We also provide tailor made packaging facility to customers as per their demands and needs. 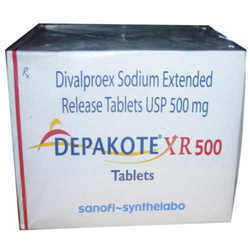 Depakote Divalproex is used to treat seizure disorders and manic phase of bipolar disorders. Divalproex is also used to prevent migraine headaches. This medicine works by restoring the balance of certain natural substances in the brain.